I alway start my morning with a large cup of earl gray tea. Another flower garden painting done in watercolor. It's not a good day when drop your ice cream cone. Ice Cream 6x12x1 1/2 oil on gallery wrapped stretched canvas with painted sides ready to hang. When we moved into our new home I found a birthday card to a little girl named Elizabeth Ann. 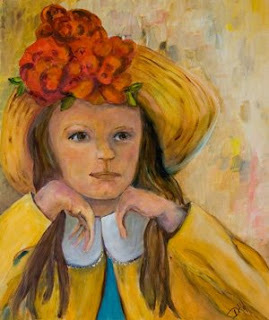 I thought it was such a wonderful name that I would paint a picture and call it Elizabeth Ann. 24x20x1 1/2 oil on gallery wrapped stretched canvas with painted sides. I painted this when I was in Maine recently. My husband and I were going into a small cafe and there was a young man sitting on the step playing and singing . It was a very cold day but everyone was out because it was the just before the primary. Sing for Your Supper 6x8 oil on canvas mounted on RayMar panel. Ready to frame. Wild Poppies 11x14x3/4 oil on stretched canvas. This painting has heavy impasto work. Hot Day 8x10 oil on hardboard ready to frame. Garden View 9x12x1 1 /2 oil on gallery wrapped stretched canvas Sides are painted and backis wired ready to hang or it can be framed if you like. One of the first things I remember drawing was pigs. When I was about ten I knew I wanted to be an artist so I decided to go out paint some of the farm animals. We had a lot of baby pigs and I sat for hours painting them. Then I decided they really were boring and I moved on to cows and other farm animals. Colored Eggs 6x12x1 1.5 oil on gallery wrapped stretched canvas wired and ready to hang. Stand Alone 11x14 oil on hardwood ready to frame. Autumn Leaves is an oil painting done on gallery wrapped stretched canvas 24x20x1 1/2. The back is wired and the sides are painted it can be hung as is or framed if you like. 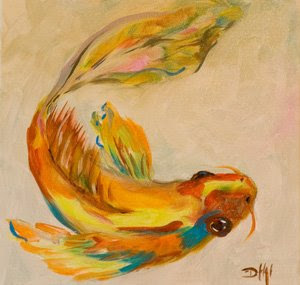 It's almost spring here in Michigan and I will start Plien Air painting in a few days. I like to paint the little buds of fresh green as they start to make a haze at the top of the trees. If you enjoy the colors of fall this is the painting for you. It will be a while before I paint fall trees again. I see warm beaches in my future. This painting was a real challenge to do given it long narrow size. I love the way it turned out. It makes an interesting statement when hung. 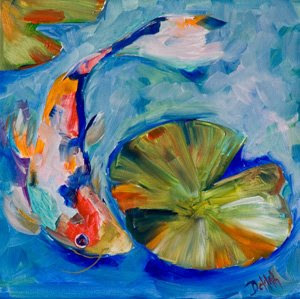 I have been painting Koi trying to get 4 paintings that are 10x10 to make a grouping. I thought they would make a nice grouping. The other Paintings are at the bottom of the page. You may buy just one if you like or all four.They are each $100.00 and if you buy all four shipping is free, just send me an email. 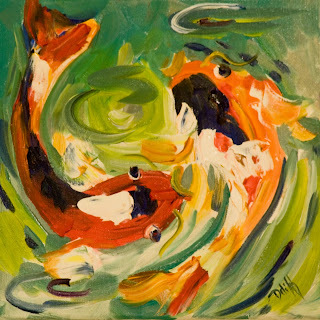 Koi 5 10x10x1 1/2 oil on gallery wrapped stretched canvas wired and eady to hang or it can be framed. Please contact me for availbity on these paintings or to have colors of your choice painted. This Abstract floral painting is done with bold brush work and bright colors. 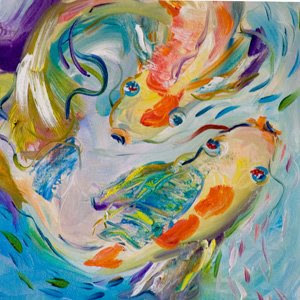 The oil painting is large 30x30 and has painted sides. It can be hung as is or framed if you like. Flower Garden is a large abstract oil painting 30x30x1 1/2. The back is wired and the sides are painted the work is ready to hang.The painting does have some imapsto areas. Gone to Seed II 16x12x3/4 oil on gallery wrapped stretched canvas with painted sides. Easter Cupcakes painting a day with Peeps and Jellybeans. 6x12x1 1/2 oil on gallery wrapped stretched canvas with painted sides. This painting is wired and ready to hang. Morning intruder is up early and making his breakfast at another birds nest. 8x6 oil on canvas RayMar panel ready to frame. Raspberries in a still life with a butterfly to add a little fun to this daily painting. 6x8x1 1/2 oil on gallery wrapped stretched canvas. This painting is wired and ready to hang or it can be framed if you like. 10x10x1 1/2 gallery wrapped stretched canvas wired and ready to hang. I create my own world fueled by some inner passion of brave optimism and confidence.